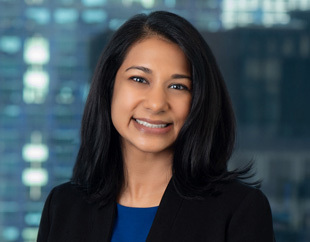 Priyanka Wityk represents financial institutions and public and private companies in connection with complex commercial disputes involving antitrust, contract, accounting, and other issues. Ms. Wityk also represents clients in connection with white collar matters. Representation of an investment bank in connection with litigation arising out of a multimillion-dollar dispute in which a former client of the investment bank sued for breach of contract and in which the investment bank asserted counterclaims to recover fees owed to it. Participated in the representation of an accounting firm in connection with an investigation by the Internal Revenue Service, including responding to the Internal Revenue Service's subpoenas and representing client at multiple meetings with the Internal Revenue Service. Representation of an incarcerated pro bono client in criminal appeal pending in the First Department in which client is appealing his conviction for possession of stolen property because the People did not offer sufficient evidence for conviction at trial and because client's motion to suppress illegally seized evidence was improperly denied. Representation of a medical service provider in an internal investigation arising from allegations of possible violations of federal health care law. Representation of a provider of analytical and litigation support services in a dispute seeking recovery of over $20 million from CDO issuers that breached their contract with the client. Representation of a shareholder in a derivative action against directors and officers of the company for breaches of fiduciary duty arising from defendants’ participation in self-dealing transactions. Prior to joining Friedman Kaplan, Ms. Wityk was an associate at Paul, Weiss, Rifkind, Wharton & Garrison LLP, where she represented financial institutions and corporations in complex commercial litigation matters, including securities class actions, shareholder derivative lawsuits, and antitrust litigation. She also represented companies and individuals in white collar matters, such as representing a bank in a Department of Justice investigation concerning anti-money laundering policies and procedures, as well as internal investigations, including participation in an internal investigation for a company following allegations of sexual harassment. Ms. Wityk is a member of the First Decade Committee of the Federal Bar Council, an organization dedicated to promoting excellence in federal practice and fellowship among federal practitioners in the Second Circuit. She is also an active member of professional organizations that advocate for gender equity and women’s rights within the workplace, including the National Association of Women Lawyers and the Legal Network for Gender Equity, which connects those who have experienced sexual misconduct in the workplace with attorneys and public relations professionals who can help them.